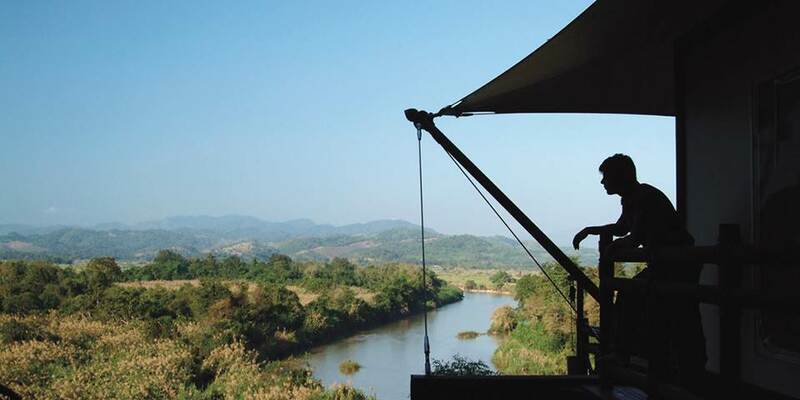 Located in the heart of the Golden Triangle on elevated grounds along a hillside, the camp commands majestic views of the Thai jungle, Burma across the Ruak River and the mountains of Laos in the northeast. The 75 minute drive from Chiang Rai airport goes across rice fields and through a village before arriving at a small dock. Guests then have the option of a magical 10 minute ride down river lounging on cushions in a traditional long tailed boat; alternatively they may arrive by 4 wheel drive after a short trek in the jungle. At the eastern end of the camp in the valley, the Nong Yao restaurant offers an eclectic mix of Thai, Laotian, Burmese and Western cuisine, all set in an open air thatched roof pavilion with rustic hardwood floors. The bar area has a double sided fireplace and guests can also relax around an open fire pit adjacent to the restaurant. Burma Bar at the western end of the camp is decorated with trekking and navigation equipment including maps, books and tribal antiques. This open air thatched roof lounge within sight of the Elephant Camp and with perfect views of the sunset is the perfect spot to sip a cocktail while curled up on one of the overstuffed leather couches. 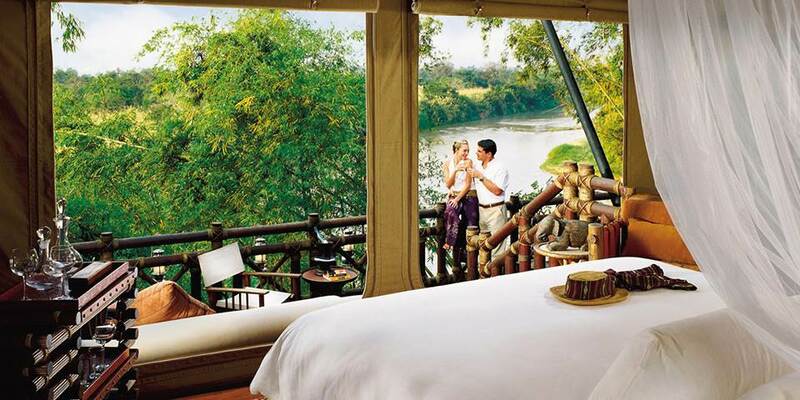 Four Seasons Tented Camp is a one-of-a-kind camp experience designed for active adults and teens. During an all-inclusive adventure of two or more nights, guests have the choice of unique activities – right from the moment of arrival in a traditional long-tail boat. 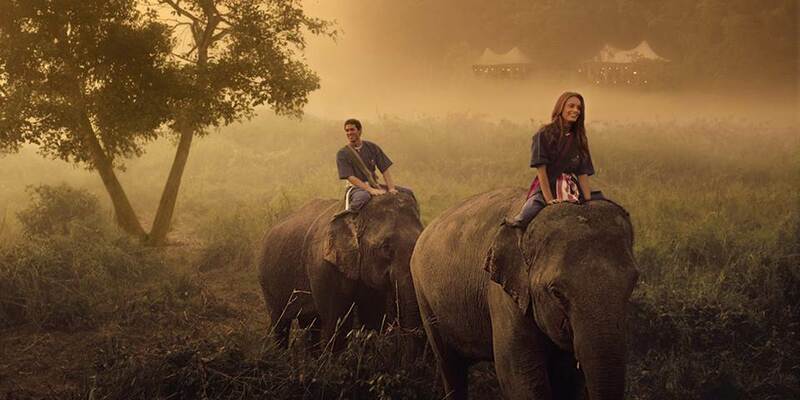 Upon arrival guests receive traditional mahout outfits which are worn when being taught how to behave around elephants and learning the basic commands of how to drive them, a skill which can be practiced on an exploration of the jungle. Witness sunrise from atop an elephant on an early morning trek to the highest point of the camp then head back down to the pool where these gentle giants enjoy much deserved playtime in the water. Accompanied by their own private guide, guests can cruise the Mekong River in a long tailed boat, passing villages and temples. A variety of day trips can be arranged to visit bustling markets or a lush royal garden, tour ancient temples and pagodas and marvel at bamboo forests and ethereal waterfalls. The all-inclusive package includes a 90 minute treatment in the therapeutic setting of the spa which is nestled amidst the bamboo forests. Here traditional Thai massages and innovative rituals are enhanced by the healing power of mountain botanicals and warming spices. 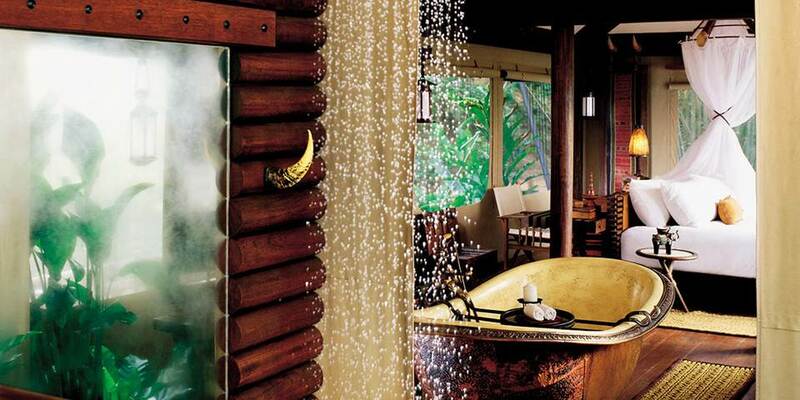 Relax and rediscover inner peace while feeling nature’s gentle jungle breezes. 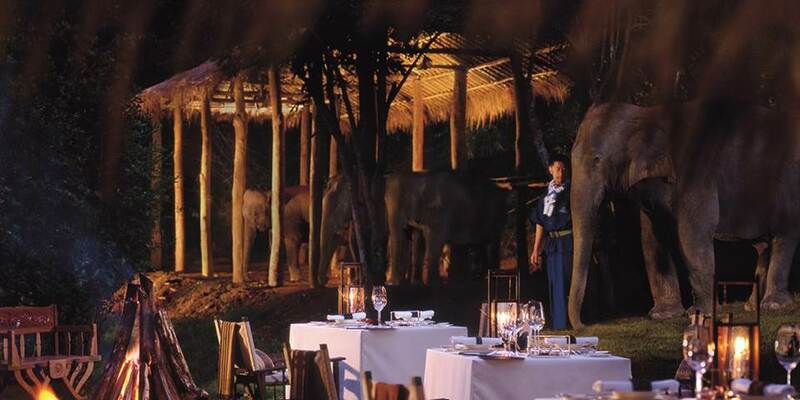 Quaint walkways lead to each of the 15 luxury tents, where elephant tusk style door handles open to a spacious living area. Each shares a common layout but is uniquely decorated and furnished in an individual colour scheme and named after local hill tribes or flora and fauna. Enjoy the open-plan space, with luxurious sleeping areas, two-person hand-hammered copper bathtubs and hand showers, an outdoor shower and a spacious deck. Additional amenities include air conditioning, heating, and complimentary minibar. The Deluxe tents also have the added luxury of a custom made wooden hot tub set on the outdoor decks, which offer stunning views of the countryside around. In an effort to protect the sounds of nature and the forest environment, televisions, DVD players and radios are not provided in the tents.